First, be advised that all of these VCD's are IN CHINESE ONLY. In our opinion that doesn't matter much because the instruction is clear and the quality of photography very good. But we will not accept returns just because people didn't read... IN CHINESE ONLY. Given that, these are really tremendous deals for the money. Each of these special VCD's can be played on a computer for full enjoyment. 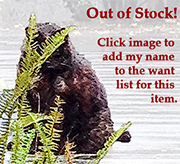 Made for PC's they are also Mac compatible by downloading Quick time (for free) and any similar VCD player program. Also playable on most DVD players. For less than $10.00? Wow! 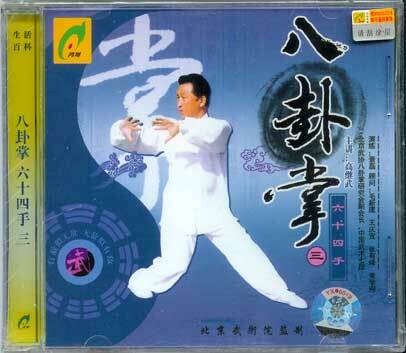 Gao Ji Wu is a fourth generation inheritor of Yin Fu style Ba Gua Zhang. 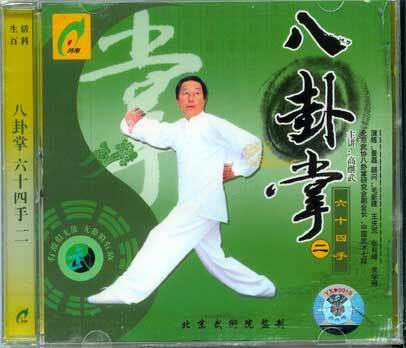 He is from a distinguished family of three generations of BaGua followers. Born in 1942 Gao Ji Wu's grandfather, Gao Wen Chang was a disciple of Yin Fu and Liu De Kuan. His father, Gao Zi Ying, was also a well known BaGua instructor who had studied under his martial uncle, Guo Gu Min, the renown Xing Yi expert Li Cun Yi, Yang Chen Fu and Yi Quan creator, Wang Xiang Zhai. Among the distinctions Gao family style has 64 Palms for fighting applications. Weapons include Saber and Elk Horn Knives. NOTE: This might, more properly, be called Yin Fu style, Gao branch. It is NOT the same as the other famous Gao style descended from Gao Yi Sheng and, ultimately, from Cheng Ting Hua. NOTE 2: This series comes in a variety of cover designs so don't be surprised if they look a little different from these representations. Gao BaGua fundamentals. Correct hand positions and walking patterns that are so essential to really learning Ba Gua. The walking demonstrated is, to our standards, definitely of a higher level than is often shown. Very slow walking with controlled hand positions that correctly torque the body. 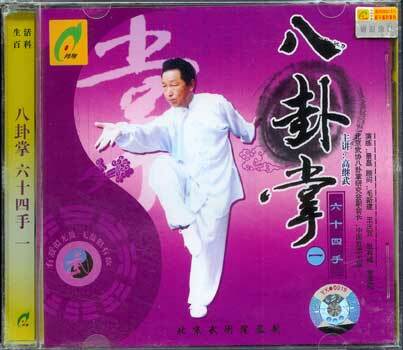 BaGua Pian Shuan Dao with Hong Yin Xiang. This is a longish, involved set performed with the large BaGua saber. Well constructed set representative of the GAO branch of BaGua developed by Gao JiWu. Teacher Hong here shows the breakdown with the aid of a student. What is distinctive about this sat is the use of the left hand to momentarily treat the saber in a double handed fashion at points in the form. Yuan Yang Yue. Mandarin Duck Hooks. Not quite the same as Elk Horn knives because they have small dagger like knives sticking out of them. They are, however, used in essentially the same manner. This is a good set with logical turns and excellent linkage of movements. The BaGua here is authentic and strong with very clear instruction. The 64 HANDS is a famous component of Gao Style. Something like a cross between Xing Yi and Ba Gua, they are performed in straight lines or "roads." Each of the eight roads has, in turn, eight techniques. Each road is shown with breakdowns for its self defense applications. In Gao style this is the predominant way to introduce the student to usage of the Ba Gua movements. Much hand trapping and switching, also throws and Chin Nah. Accompanied with a list of the 64 Hands in Chinese. This first VCD shows the first three roads. The second VCD shows Roads four, five and six.This third VCD shows Roads seven and eight. On the remainder of the VCD is a SURVEY, a very rich one which includes; 8 Big Palms, Dragon Form, Rolling Body, Two person practice (not fighting, just walking), Swimming Body, Saber, Sword, Double Headed Spear, Elk Horn Knives and BG sickles.